Welcome to Puzzle Baron's Campsites! Whether you know them as campsites or tent puzzles, we've got hundreds of thousands of unique puzzles here for you to solve. You can play for fun, or register a free account and compete against other players for the Campsites Hall of Fame! 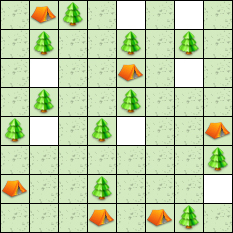 In a campsite puzzle, you're given a basic grid with a set number of trees placed within it. This is your "campsite". Your task is to figure out where each of a set number of tents needs to be placed in order to fulfill the precise number requirements for each row and column. Each tent must be placed orthogonally adjacent (left, right, above or below) to a tree, and no tent can be orthogonally or diagonally adjacent to any other tent. Each puzzle has one, and only one, unique solution. Why Register a Free Account? Monthly Competitions - registered players are automatically entered into our monthly scoring competitions, and are eligible for our Hall of Fame listings. Record solve times are also kept exclusively for registered members. Resume Puzzles - save your progress on any puzzle and return to finish it later anytime within 24 hours. Premium Upgrades - registered users are eligible for premium upgrades which remove all advertising from the site and result in a noticeably larger playing area on the puzzle solving page. How many letters are in tree?